What is your practice of decluttering? Have you ever considered being a minimalist? I definitely wouldn’t call myself a minimalist, but I don’t love clutter. I want our house to be neat and tidy and regularly make the practice of clearing out unnecessary items. About a year ago I came across some of Marie Kondo’s practices, namely, her practice of vertical filing of clothes in the chest of drawers. I loved the idea and it really was life changing for our family. With that said, vertical filing is only one tiny part of the Konmari practice. To learn more, I read her best selling book “The Life-changing Magic of Tidying Up” and watched her “Tidying Up” show on Netflix! The KonMari method has two basic components 1) discarding and 2) deciding where to store things. Kondo focuses heavily on decluttering or discarding, after all, she’s a minimalist at heart! 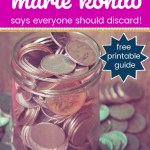 Let’s take a look at the basics of her method and the 16 things Marie Kondo says to discard. The KonMari Method is a very specific approach to decluttering. Marie Kondo insists her clients make tidying an event…a marathon is actually how she describes it. She wants people to do one major overhaul and then micro activities daily to maintain a tidy home. The KonMari method has people tidy (discarding + storing) by category instead of by room. For example, instead of tackling your bedroom and then your kitchen, she has you sort something like clothing from all of the rooms at once. Based on her experience with clients, Marie has specified the order to take on the tidying process. She also has an order of categories within each category. For example, when sorting clothing, you should do it in the following order: tops, bottoms, clothes that should be hung, socks, underwear, bags, accessories, clothes for specific events e.g. swimsuits, and shoes. In order to identify what things need to be discarded, she recommends gathering all of the category items throughout your house and putting them all in the center of the floor. This helps one to visually see how much they have accumulated as well as makes you deal with it at one time instead of repeating the process with the same types of items multiple times. does it still have a purpose / function? might I or someone in my family use it someday? could I repurpose it for something else? I warned you, I’m not a minimalist and I can find plenty of good reasons to keep things! With that said, the book included many good points and I was inspired to immediately prune things from our home. We already talked about this earlier and it’s important to note that this applies to all categories, clothing, books, paper, sentimental items etc. 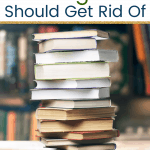 Marie shares that most people have too many books and specifically unread books. In her estimation, the majority of people never find the time to read these books. If they haven’t already, they likely won’t in the future. It’s time to get rid of them! Reference books include study guides, old text books, dictionaries etc. Her logic is that we likely don’t use these and therefore they fall into the same category as the unread books. She also questions if these bring joy for most people! Papers include bills, receipts, credit card statements, old warranties, manuals, greeting cards, used checkbooks, and pay slips. Marie recognizes that they serve a purpose for a short period of time, but then it’s time to get rid of them. Additionally, in most cases, none of these spark joy. (See #1!) Once you get your credit card statement, confirm it’s accuracy then shred. Her “rule of thumb is to discard everything” related to paper. She excludes items of sentimental value like journals, and personal letters. There are 3 exceptions to this rule. Papers that are currently in use, are needed for a limited period of time, and papers that must be kept indefinitely. We’ve all received gifts that weren’t exactly our style or perhaps we didn’t have a use for. Marie says to get rid of them! We are not obligated to keep them. The real joy came when the giver gave you the gift, but that time has passed. Cherish the memory and move on. I have to admit, I was glad to read this one. Lancôme is my make-up of choice and I have made a practice of only buying makeup when they have their “gift with purchase” events. As a result, I had a ton of face moisturizers, eye moisturizers, colorful pallets of mini-eye shadow sets. I’ve kept them for years and usually never use them. You’ll be pleased to know that they no longer reside in my home! Marie’s logic is that most people keep these samples in order to take them when they travel, but then they usually forget they have them. 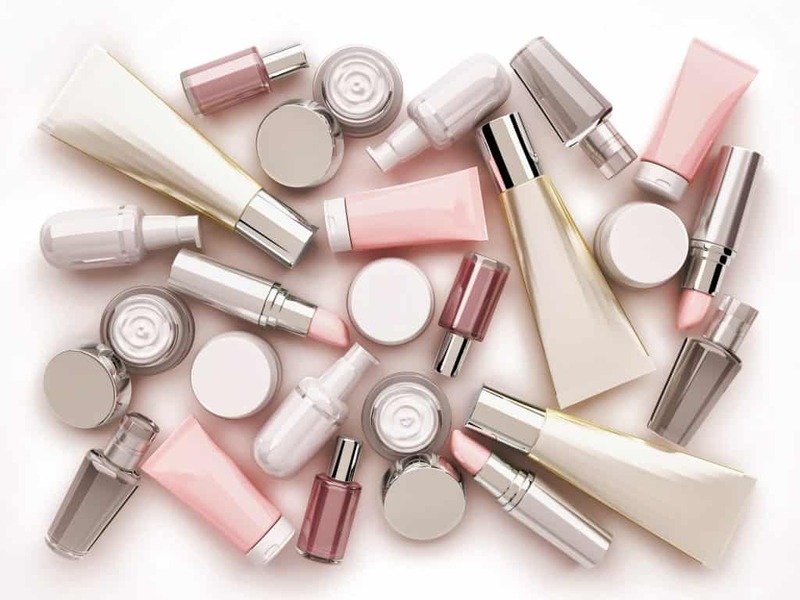 But, don’t worry…if you love your cosmetic samples, and they “spark joy” then you are in the clear to keep them!!! Many people keep boxes for their cell phones, computer, etc. They think it will increase the value if they resale. Others keep boxes in case they move. Marie suggests that it costs more to store empty boxes than the value they add to resale. She recommends getting boxes when you move instead of storing them. This is one that is now on my to-do list. We have a plastic bin full of empty technology boxes. I’m pretty sure we don’t need to keep them around! Do you have a bag or box full of spare electronic cords? Maybe it’s one for an old iPod, a camera, or that whatchamacallit you bought in 2010. Throw it out…at least according to MK! I’m in agreement. We never go into our box when we’re looking for a cord. We just assume after we’ve looked in the usual places that we no longer have the cord. Our personal Marie Kondo pile is getting pretty big! Now, I can’t relate to this one at all. But apparently, many of Marie’s clients keep broken TVs or radios around. If this is you, it’s one more thing that you can discard! This one hurts a little. I have a hard time getting rid of old comforters, extra linens, and even towels that no longer go with our décor. Usually, they are not worn out and I always believe I can repurpose them e.g. a drop cloth for the next time we paint. 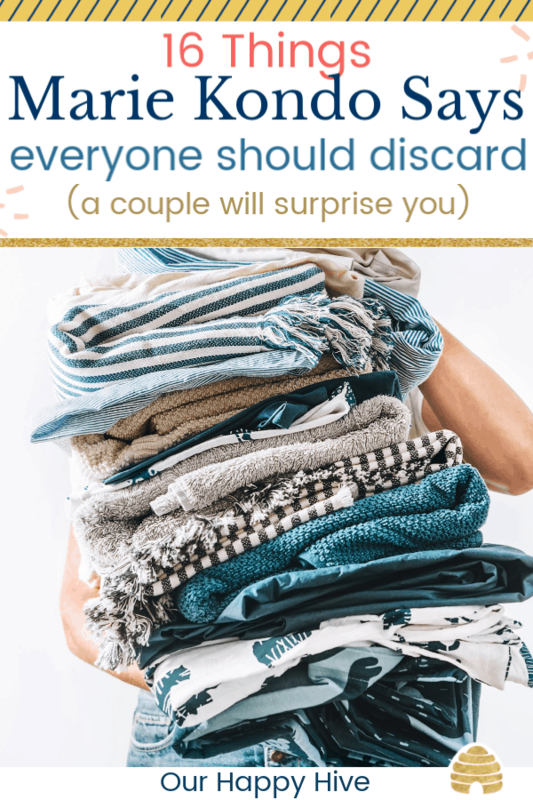 KonMari teaches that if you have extra bedding you’ve saved for your guest room, but you don’t have guests very frequently, then it’s time to get rid of it. They will just end up smelling and won’t be nice for your guests. I guess I have some more work to do! Do you save all of the spare buttons from new suits, tops, or dresses in case one day one pops off and you need to replace it? This is another item not worth saving. Marie’s experience says that the majority of people never actually uses these spare parts. Discard! Machines, gear, I’d imagine even old hobby items could fall in this category. If you bought rubber bands for resistance when you exercise, Suzanne Summer’s Thigh Master, or Buns of Steal 😂 and never use them, then it’s time to part ways. Novelty goods you picked up at a conference while traveling, or even in the office and little gadgets or pens with a businesses name on it. These are unnecessary items and likely don’t spark joy. Now this one surprised me! Kondo does not recommend keeping spare change in your house…not in a jar, a bag, a bowl, or even a piggy bank. Change should be spent. Put it in your wallet and get it out of your house. Of course, rule number 1 is huge with this bucket. Marie keeps sentimental items as the very last thing to sort through because it’s the toughest for people. She feels we should cherish the memories and not the things. If you’re holding on to old love letters, excessive historical photos, or things your grown kids made when they were little, it’s probably time to check your joy-meter. Does it feel burdensome to keep these things…is it time to part ways? Last but not least, Kondo acknowledges that many of her clients have unusual stockpiles. She shares examples of people that kept excessive amounts of plastic wrap, toilet paper, and even cotton swabs. 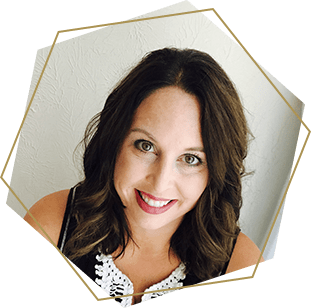 If you have something you frequently buy and store, Marie encourages you to evaluate your actual needs and how much you really need to have on hand. Ahem, that would be paper towels for my family!!! After reading “The Life-changing Magic of Tidying Up”, I have my work cut out for me. I can see a long list of things that we can part with, we really won’t miss, and will make our home more manageable in the end. I like the idea of keeping things that bring joy, but I don’t know that I’m fully onboard with that being the only criteria. Perhaps I’m a bit too frugal or practical for that…or maybe I just need to give it a try and see what happens?!? Her marathon type approach to tidying would be very hard for moms with young kids unless you have a nanny, reliable babysitter, or family nearby. I would have to do it in smaller chunks, which she discourages. I can live with that. In my mind, progress is better than perfection. How about you, did you recognize things you can discard? Do you think you’ll do a marathon or several sprints? Here’s to tidy and more manageable homes! I hear ya! I don’t think I could do the Marathon approach she suggests. Personally, I’ve tweaked it and done a little at a time e.g. the kids clothes and then my clothes. You need to do what works for you! I found the list quite interesting and had a flash back to last year when I was purging stuff for a move across country. In our crawl space there was a huge ( I’m talking the biggest you can buy) Rubbermaid tote full of electronic cables, computer mouse, headsets etc which no longer worked. For some reason over the years my husband had convinced me we would use them again. I took them to the Recycling Center. I was told this was the largest deposit of such items. I was embarrassed. That was not a compliment. And since then I vowed it will never happen again. But I have to question why I packed and moved the original boxes for our iPhones and iPad. Obviously there is still some work to do but I do feel proud. I got rid of 3/4 of our household items last year. What a fabulous feeling. And so far we have not missed a thing. Thanks for sharing Jackie! We have one of those boxes too and I’m committed to getting rid of it soon! That’s awesome that you got rid of 3/4 of your stuff! I’m so motivated to declutter and have less stuff…especially the unnecessary things we hold onto! If anyone is feeling badly about getting rid of old bedding or towels (I do!) please remember that your local animal rescues or SPCAs will normally take them. They use good items for bedding for dogs and worn items for rags or toys for the animals. I’ve felt so much better about getting rid of bedding since I found that out. That’s a great point, Jessica. Thanks for sharing! We made a move to another state 6 years ago and when we sold our big house we had a garage sale. I thought I got rid of lots of stuff, however, while we were building our new home we lived in an apartment with just necessities. When we finally got into our new place and unpacked i realized I should have sold and donated twice as much….and we paid to move it all!!! I then discovered the M.Kondo books so am on the decluttering train. Can’t do it all at once but have made progress room by room. I will never be a minimalist but. feel good when I open my kitchen drawers and pantry etc. I think it will always be an ongoing thing for me. Appreciated your post. I did the same thing…and I paid to move my stuff across the country!!! I wish I would have read Marie Kondo’s books sooner! Like you, I guess it’s never too late! Not doing a marathon, but getting there little by little. Loved her book Spark Joy. I have learned to toss on a constant basis!! I find doing this keeps me happy and best of all the stockpiling isn’t an issue. I am a senior do it took some time to teach myself but has been a great reward!! Simply no more piles of miscellaneous stuff!!! Hi. I started on clothing first. Working now on my folding. ( I’m truly amazed) Handbags and jewlery and socks, not today. Good luck. I decided to start somewhere and end without a timeline. My children are artistic and I saved lots of their art work. When it came time to move and downsize I photographed most of it and saved it digitally. I get where you’re coming from with cosmetic samples, but I went with a different idea for those. I gathered them all up and made a conscious effort to use them, starting with the smallest one. I think a went a couple of months without needing to buy shampoo, and my perfume samples lasted a few months. It was a nice way to declutter while cutting expenses. I love that bit at the end, about progress being better than perfection! I also feel like whenever we encounter a new method, philosophy or idea, we need to weigh it against our own belief system and see if it fits in our lives. For example, I’m more than happy to keep a majority of clothing that sparks joy in my wardrobe, but I will also keep my beige slip dresses and tank tops. Do they spark joy? Well, it’s hard to get excited by beige 😅 But are they necessary underneath a white dress or top? I very often find so. I haven’t read the book or watched the show, but I intend to. We live on a small ranch 35 miles from the nearest town and 60 miles from most amenities. I have stockpiles of most everything because it’s necessary. We also repurpose a lot of things too (empty coffee cans have many uses). I didn’t grow up ranching (I came from a very tidy military family), so I am always searching for the balance between keeping enough and not feeling overwhelmed by stuff. Needless to say, it’s a challenge!! I’m a minimalist at heart, but my shelves say I’m prepared for armageddon. Not sure if I can incorporate all aspects of Kondo’s system, but I do hope to purge and tidy up where possible. Great list! Having an IT husband, we are the worst for spare cords! I agree with you that I can’t marathon it either. I created a system for myself this year where each month I focus on a different category – with the goal of being more organized by the end of 2019. So far it’s going really well, and it is making it more manageable for me! And it also makes it easier for my husband to get involved too.